First, as we reported last week, Tesla has indeed broken ground on the Tesla Giga factory outside of Reno. It would appear that activity has slowed at the site, according to an analyst on the Tesla call who cited the "blogosphere." Here are the highlights, according to the investor presentation and earnings call that "beat estimates across the board and continued to show gross margin improvement," according to investment bank Baird. Giga factory: The long-rumored Tesla-Panasonic partnership on the $5 billion Giga factory was officially revealed. Panasonic will be fulfilling the role of manufacturing partner. The company has long been the primary supplier of lithium-ion cells for Tesla. Site preparation for a potential Giga factory location started in June. According to Tesla, "Processed ore from mines will enter by railcar on one side, and finished battery packs will exit on the other." The company states, "Consistent with our strategy to identify and break ground on multiple sites, we continue to evaluate other locations in Arizona, California, New Mexico and Texas," adding, "Any potentially duplicative investments are minor compared to the revenue that could be lost if the launch of Model 3 were affected by any delays at our primary Giga factory site. Q2 deliveries and shipments: Tesla had record Q2 Model S deliveries of 7,579 vehicles, in line with guidance and consensus. Tesla built 8,763 vehicles in Q2, setting another record. Retooled assembly lines: The Model S/ Model X assembly line has been retooled and is planned to begin operation next week. Loss of production in this changeover week might impact Q3 production numbers. The upgrade includes a new final assembly line and more automation in the body shop. 2014 deliveries: Tesla is looking to deliver more than 35,000 vehicles in 2014, with Q4 production of greater than 1,000 cars per week. China: The Model S is off to a very encouraging start in China, according to the company. The primary complaint Tesla has heard is about long delivery times. For the rest of 2014, the rate of location openings will be fastest in China. Investment bank Barclays points out "the increased importance that China will need to play in meeting Model S guidance for 2014." Musk stressed the importance of a service and sales infrastructure needing to be in place in order to meet demand. Supercharger network: The company energized its 156th supercharger, which makes its network the largest and the most rapidly growing fast-charging network in the world, according to the EV maker, which measures the network’s size by charging capacity. "We do not have a demand problem." Musk suggested that Tesla's "annualized delivery rate should exceed 100,000 units by the end of next year." Development efforts remain on track for production of Model X in the spring of 2015. Tesla expects to deliver around 7,800 Model S vehicles in Q3, below some analyst expectations. The company also expects to "lease about 300 cars in North America during Q3, and much more in Q4." Operating expenses are expected to grow sequentially by about 20 percent for R&D and 15 percent for SG&A, according to the firm, which says it plans to invest "between $750 million and $950 million in 2014, an increase of $100 million from prior guidance." 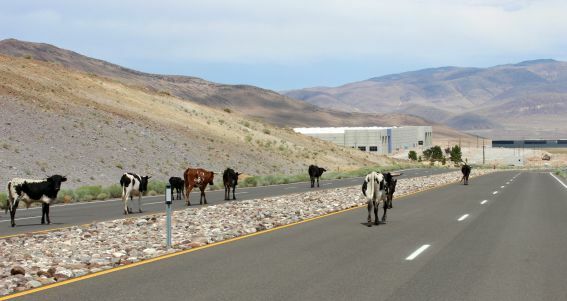 It appears that work has already begun on the site of the new $5 billion Tesla Giga factory near Reno, Nevada. It's the planned location of the world's largest lithium-ion battery factory and the potential enabler of lower-cost Tesla electric vehicles. It's either that or a really big pizza factory. Our unnamed source (Bob Tregilus) hiked a few high-desert ridges in Storey County, Nevada to take pictures of 50 earthmovers moving earth at a site that Tregilus estimated to be large enough to accommodate the proposed 10-million-square-foot factory. Tregilus has also heard whispers about a secret project from construction industry folks and locals. It's a great photo, but it turns out that last month, the Reno Gazette-Journal reported that "an excavation permit to begin site work for a sizable project has been pulled [on May 22] by the Tahoe-Reno Industrial Center" at 2641 Portofino Drive. The paper notes, "The business park could potentially begin site preparation work before any official contract with Tesla is signed, adding, "In addition to the excavation permit in Storey County, the contractor for the Portofino Drive project has air quality and storm water permits from the state's Environmental Protection Division." There was no confirmation that this is indeed the Tesla site. According to the TeslaMondo and Tesla's own blogs, the site is also potentially the site of a pizza factory. Tesla is not commenting. 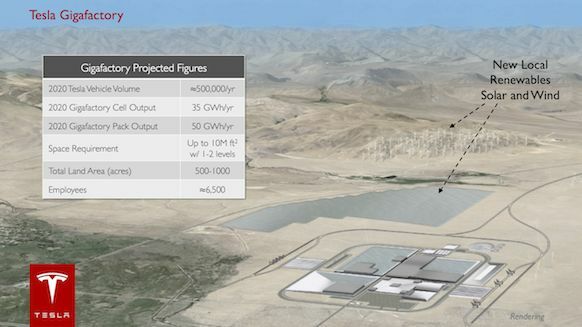 Reno has been considered the front-runner for Tesla's vertically integrated super factory. In March we covered the deep politics surrounding the Tesla battery Giga factory -- which pitted Texas, Arizona, New Mexico, Nevada and California against each other for the rights to the $5 billion high-tech manufacturing site. Tesla aims to build 500,000 cars per year by 2020 and will need an unprecedented volume of lithium-ion batteries to hit this target. We recently covered a presentation from Tesla CTO JB Straubel, in which he spoke of attacking the battery's cost with the Giga factory by "doubling the worldwide capacity in a single factory and reinventing the supply chain." A total of 35 gigawatt-hours of cell production from the new plant will be devoted to meeting the needs of the Fremont automotive plant, and 15 gigawatt-hours will be devoted to stationary battery packs. Straubel said that Tesla was "bullish" about the California energy storage mandate. Straubel also said he was bullish that stationary energy storage "can scale faster than automotive." The project has the potential to provide more than 6,000 jobs. Or millions of pizzas, as the case may be. Elon Musk, Tesla CEO, is intent on moving forward with two sites, according to Bloomberg, saying in an earlier interview, "What we’re going to do is move forward with more than one state, at least two, all the way to breaking ground, just in case there are last-minute issues." 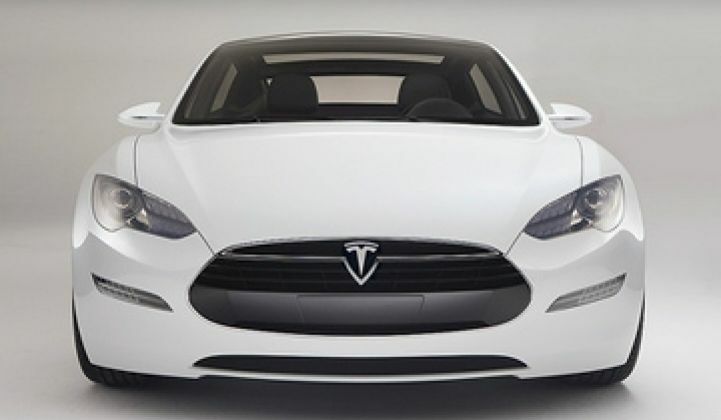 Tesla expects to reduce the kilowatt-hour price of batteries by 30 percent. The facility will house more than 6,000 workers in 10 million square feet of factory space.